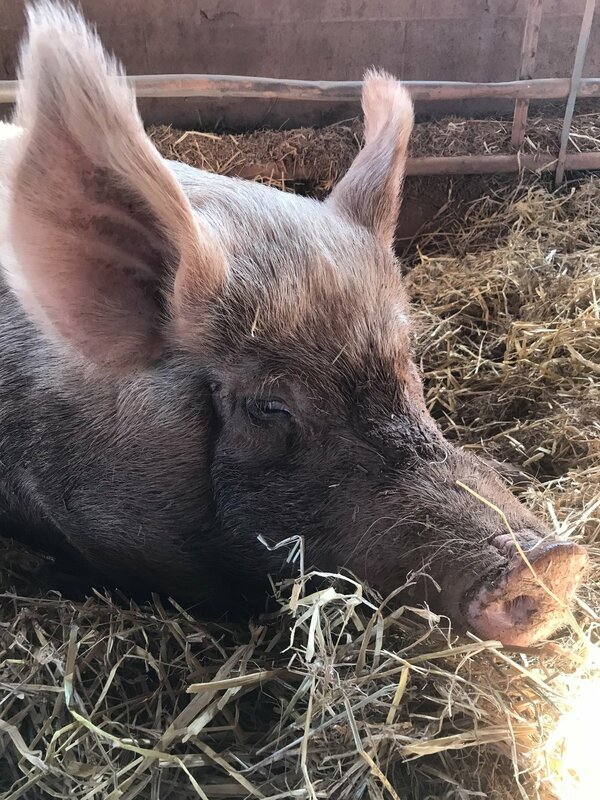 Poplar Spring Animal Sanctuary is a 400 acre non-profit refuge in Poolesville, Maryland for farm animals and wildlife that relies entirely on public donations for support. Our mission is to offer care, rehabilitation, and permanent sanctuary for neglected, abused or abandoned farm animals, as well as providing a protected habitat for wildlife. We promote compassion and the humane treatment of all animals by educating the public on farm animal and wildlife issues. For the past 21 years they have invited the community to tour the farm, meet the animals, and try delicious vegan food. I had it noted on my calendar as a reminder, but hadn’t firmly committed to going until the morning of the event. Chris, my husband, and I decided it was a beautiful day to be outside and we were not disappointed. When we arrived, we tried a few of the vegan food options and gratefully grabbed a cup of coffee from Brewing Good Coffee Company (delicious!). This is Mason, the rooster. He was found on the Shenandoah Trail by a hiker and brought to Poplar Springs. Everyone loves a good scratch. Having fun in the sun. Beautiful Lily getting a nose rub. Taking an afternoon snooze in the barn. Gave this sleepy pig some ear scratches. If you ever get the chance, I recommend visiting an animal sanctuary to really make a connection with these beautiful creatures. If you have been following Living Well and Wild, you know that I advocate a vegan lifestyle. It is because I can’t imagine consciously harming another living being or paying to have it done. If you are interested in finding more about making the transition to a vegan lifestyle, please don’t hesitate to reach out. I would love to support you! You can also sign up to try veganism with Challenge 22. What is your favorite plant-based meal?